“Sweet with a little heat” is the best way to describe the combination of flavors this vibrant and healthy dish brings to you, your family, and guests as you gather around the dinner table for an evening meal. Kevin gives it two thumbs up, and he is most proud that it is filled with many essential nutrients such as protein and Vitamins A, B, C, and K. The inspiration for this recipe comes from “Bon Appétit,” December 2009 edition. May your time around the dinner table be filled with grace, thanksgiving, and joy as you invest in the life of one another over a good meal and a hearty conversation. 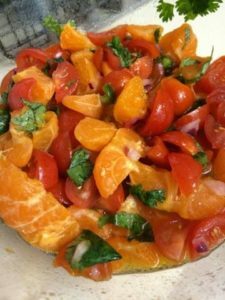 A photo of Clementine salsa that goes over the Chicken Paillards. Mix clementines and next 7 ingredients in medium bowl. Season with salt and pepper to taste. Cover and let stand at room temperature. Sprinkle chicken with salt and pepper. Heat olive oil in skillet. Add chicken and cook until cooked through on each side. Transfer chicken to platter. Add clementine juice to skillet; boil until reduced to ¼ cup, stirring often. Drizzle sauce over chicken. Spoon salsa over chicken. Serve over a bed of spaghetti squash, rice, or spaghetti noodles. Enjoy!